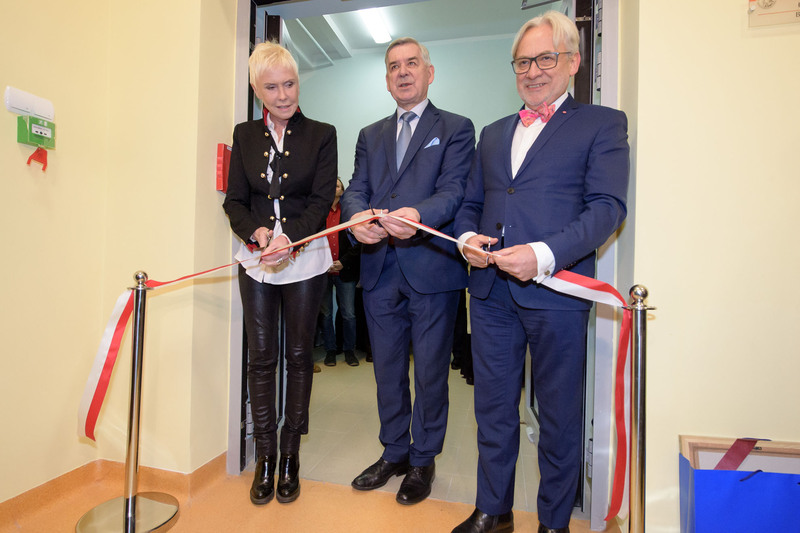 Poland’s first Clinic “Alarm for Adults” was officially opened. The Clinical University Hospital in Olsztyn, is waiting for its first patients with 8 open places. This is a very important moment, that this year we were able to open the Clinic. Now the most important thing is to negotiate a contract with the National Health Fund, so that patients will be able come because already 50 people have signed up, much more than than the possibilities of this place and therefore for adults it will be necessary in the future to open another Clinic. Annually approximately 4 to 5 thousand people are in a coma, some people dye, some people will wake up immediately, and others remain suspended between life and death. This is precisely for these patients, for them “Alarm” has been opened- says Ewa Błaszczyk President of Foundation And Who? “Alarm for Adults” will help adults in coma in the first year after the accident and those adults who were in a coma due to hypoxia. This therapy will be reimburse by the National Health Fund. At the beginning of the Clinic there will be a count of 8 beds. Professor Ryszard Górecki, Rector of UWM, stresses that the Clinic is at the stage of a long-term joint venture with University Authorities and the Faculty of Medical Sciences. -The University has been involved in this project, putting the University’s money in the repair of part of the hospital. But at this level it will not stop; in the coming years there must be another new wing of the hospital opened. We want to have at our University, in the Clinical University Hospital a treatment center for the the heart and brain, because in Poland, there is a lack of an integrated system of treatment of these organs. We want to develop this type of treatment as is practiced in Japan and the United States- informs Professor Ryszard Górecki. In the Clinic for these patients awaits for them world-class modern equipment, including the so called cyber-eye system, which is used to examine whether the patient uses the eye for understanding. It helps not only to diagnose a patient, but also to establish contact with the patient. The therapy also helps accessories for magnetic resonance imaging – glasses and headphones for fMRI. The equipment was purchased with the initiative of the Foundation And Who? by Fundację Wielkiej Orkiestry Świątecznej Pomocy (Foundation of the Great Orchestra of Holiday Charity). This equipment will be one of the main tools to assist in the diagnosis of people in a coma. This will help to distinguish vegetative state from the minimum loss of consciousness state (which qualifies patients for rehabilitation in the Clinic). Thanks to these glasses during MRI, patients in a coma will see a showing of family photos and videos, voices of loved ones, ect. With these incentives physicians accurately determine whether the coma patient’s brain responds and which components are damaged in the brain. Glasses are also used in the diagnosis of other diseases. As reported by Professor Wojciech Maksymowicz, Vice-Rector of the Faculty of Medical Sciences, one of the initiators of the “Alarm for Adults”, the Clinic will be able to target patients who have completed 18 years of age on the date of admission, are in a coma for no longer than a year after injury or 6 months from the date of atruamatic coma (the time of the event causing coma may not be less than 6 weeks), they have stable vital signs and breathe without mechanical support and or respirator. The duration of treatment should not be longer than one year. Based on a comparison with already acting Clinic “Alarm for Children” for rehabilitation in the “Alarm for Adults” will qualify for about 100 patients a year. The annual cost of rehabilitation of a patient was established at the level of 237 250 złoty (Polish Currency). The following next 3 years after the end of treatment the patient or the caregiver should be subjected to correspondence survey, which aims to monitor the effects of treatment. Adults in coma had unprecedented opportunities for specialized rehabilitation. They were usually sent back to their homes, and no one was able to help them.